Go Boston 2030 is the framework for the future of transportation in Boston, and one of its primary goals is the reduction of traffic accident fatalities. Many believe that a major step toward achieving that goal is a shift to driverless cars. Autonomous vehicles are a significant component of the Go Boston 2030 transportation plan. But is Boston ready for self-driving cars? Driverless cars are already on the roads in Boston, though in a testing capacity and in limited numbers. Boston’s New Urban Mechanics department has been instrumental in developing the city’s technology-focused programs, which includes autonomous vehicle (AV) trials in Flynn Marine Park, the Innovation District, and the South Boston Waterfront. New Urban Mechanics manages about a dozen street-focused programs ranging from solar-powered benches to mobile apps that help you park, but none of the programs have received the same attention as driverless cars. Recently, Google’s autonomous vehicle program, Waymo, announced it would no longer have someone behind the wheel of its self-driving vehicles in Chandler, Arizona. This represents a major leap forward in AV testing, and there’s a reason the jump was made in Arizona. Unlike Massachusetts, Arizona has nearly year-round sunshine and very little annual rain or snow—it’s a best-case-scenario state for AV testing. Waymo and other AV technology companies have acknowledged that, for now, precipitation adversely affects the light-sensing, radar-like equipment on self-driving cars. Ford is trying to fix the problem with “high-fidelity, 3D maps of roads,” but these are like fixed blueprints and they don’t change when, for example, a person crosses the street in front of the vehicle. For many people, the idea of autonomous vehicles is still more science fiction than reality. As driverless cars inch closer to widespread availability, they raise a number of intriguing questions. Is the public ready to surrender control to this nascent technology? How long will innovation and convention drive side-by-side? Will driverless cars really improve traffic flow and decrease accidents? 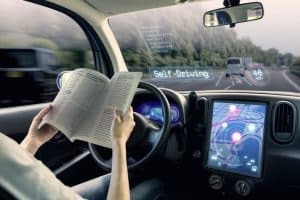 What are the liability issues when an autonomous vehicle is in a collision with a human-operated car? Are drivers ready to surrender control to new technology? In other words, self-driving cars are getting hit by other drivers. In nearly all cases, these collisions were at low speeds and rarely caused injury; however, of the injuries that were reported, all were sustained by occupants of the autonomous vehicle. Another public concern is access. The Tesla Model S, which features “autopilot” technology that is believed to have contributed to a driver fatality in 2016, is not what you’d call an “economy” vehicle. On the low end, the Model S starts at nearly $63,000. Until the vehicles become more affordable for average consumers, it’s likely that autonomous vehicles will first proliferate among ride-sharing companies like Uber and Lyft, as well as businesses like Amazon that can use self-driving vehicles for delivery. Public infrastructure poses another challenge to the broad integration of autonomous vehicles. Municipalities like Boston are only beginning to understand how much change may be required to accommodate driverless cars and how these vehicles affect other aspects of traffic, road maintenance, etc. Self-driving cars, for example, use painted roadway lines and other traffic indicators to help orient the vehicles. These components must be uniform and well maintained in order for the AV technology to function properly. As the use of self-driving cars expands in coexistence with human-operated vehicles, adjustments may need to be made to traffic lanes and signals. Autonomous vehicles may also prompt changes to parking and drop-off policies. So far, states and cities have led the way when it comes to developing and implementing AV regulations. There are currently no federal standards regarding licensing, testing, and operating self-driving vehicles. Liability issues also remain largely undefined. Accidents involving autonomous vehicles could create complex legal issues in the event of an injury or death. Cases related to self-driving cars may share more elements with defective product law than traditional motor vehicle accident law. The rise of autonomous vehicles raises numerous questions about accident liability and privacy, among other concerns. The rise of autonomous vehicles has also stirred concerns over personal privacy. 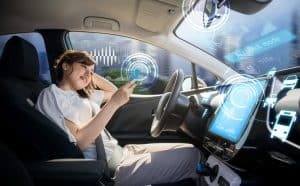 Without privacy measures in place, people who rely on self-driving cars or ride-sharing services that use AVs may have to give up personal information every time they travel. The Atlantic sums it up like this: “In this near-future filled with self-driving cars, the price of convenience is surveillance … The more personalized these vehicles get—or, the more conveniences they offer—the more individual data they’ll incorporate into their services.” Imagine an autonomous vehicle recommending you stop for dinner at a new restaurant because the eatery paid Google to deliver you a tailored promotion. Legislation at the state and federal levels will likely be the only way to address some of these concerns. By hosting AV testing facilities and collaborating with ride-sharing organizations, Boston has been proactive in embracing driverless cars. Likewise, the Boston attorneys at Jason Stone Injury Lawyers are working hard to prepare for the most significant changes to car accident law in more than 100 years. If you were hurt in any type of car accident, we’re here to help. Call us at 800-577-5188 or contact us online to arrange your free consultation. For updates about autonomous vehicles in Boston and other legal matters, follow Jason Stone Injury Lawyers on Twitter or “like” us on Facebook.